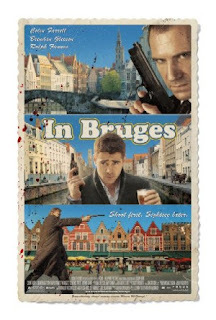 I finally got to see the movie In Bruge last night. It is one of smartest movies I have seen in a while: think Reservoir Dogs only (marginally) less bloody, with an added dash of black, Irish humour. Colin Farrell is great, but Brendan Gleeson is a revelation in his role as a 'hitman with a heart'. As for Ralph Fiennes, nobody will accuse him of being typecast after this movie: he plays the most convincing Cockney gangster since Bob Hoskins in The Long Good Friday. It's a joint Irish/British production, written and directed by Martin McDonagh. The cinematography is superb, both in terms of the location and the action sequences. The movie has a nice 'Europe at ease with itself' feel about it - such that just about every minority group manages to get a lash from the politically incorrect tongue of Colin Farrell's character Ray (even, er, the Canadians). Maybe we have entered the era of post-political correctness - and to think it all started in Bruge.